 Spend less time recording data and more time creating content that sells! Income reports are now easier than ever, with our traffic, income and expense tracker for bloggers. Use this tool to record all data related to your blog’s growth and bottom line to keep careful track of what you are spending, what you are earning, when you are earning a return on your investment, and how your traffic growth correlates with your revenue. We often write about how we do not consider blogging to be a hobby; that it is a business, and thus, should be treated like one. There is no business in the world that makes money without spending money, and blogging is no different. When you first set up your blog, you’ve got to buy your domain and hosting plan. When you create graphics to go with your articles, you may purchase stock photos. As you get serious about blogging for profit, you may incur expenses from a variety of places: you may spend money on materials to learn about blogging in general, you may participate in courses such as Making Sense of Affiliate Marketing to learn how to earn money from your blog using affiliate programs, or you may buy an E-book like Pinteresting Strategies to learn how to drive Pinterest traffic to your blog. Blogging is useless if no one is around to read it… am I right? Investing in your blog is simply necessary. Then comes the traffic and the income. Way more exciting than expenses. All of those expenses probably come with the goal of earning a return on your investment. You want to make money blogging. You’re working hard on it, so why not? You’re watching your traffic to see what your readers are interested in and clicking on, you’re checking your affiliate networks on a regular basis to see if you earned any money, and you’re stalking other people’s income reports to learn new ways to make money blogging. That’s a lot of information; information that is KEY to succeeding as a blogger, but also super easy to lose track of. If you really want to see those numbers soar, you have to keep proper track of your data. We realized that bloggers have a love/hate relationship with writing income reports. Their main complaint is that it takes too long to put it together. The problem doesn’t seem to be in actually writing the details behind the report. The problem is gathering the data for the report, creating graphs, comparing numbers, and really visualizing and measuring their blog’s successes or failures. Most bloggers do track their expenses, revenues and everything in between. But it seems that very few have a centralized location for all their data. So, it is of no surprise that when it comes time to review their business blog’s progress at the end of the month, they consider this process extremely time intensive, as they work to combine all their reports to analyze (usually in the form of graphs). With The Millennial Bull, we don’t run into this problem. Why? Because the Traffic & Income Tracker is so straightforward that it’s quick and easy to jot down our data every day. It literally takes minutes. When we are ready to put together a report or sit and review what’s working and what isn’t, all of the information is right there, in one place. To be honest, we waste more time going in and out of Google Analytics on a daily basis to see if we made any conversions or if our traffic is up than the 10 minutes spent updating the Tracker every morning. Also, just like you, we write down our expenses every time we make a business-related purchase. So, it makes most sense to record them in a centralized location that will be useful to us in our future analysis, rather than on a random document that we will later forget about. It will save us a lot of time in the long run. We are all about efficiency. We like to spend less time on the small stuff and more time creating content and making decisions that increase our bottom line. 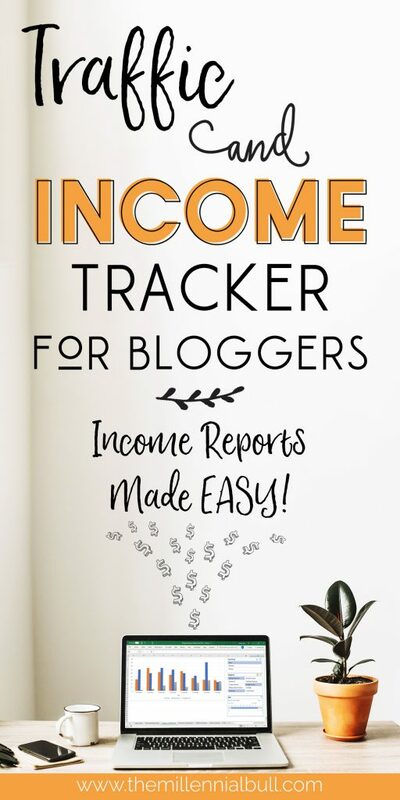 With the Traffic and Income Tracker for Bloggers, creating an income report literally takes one second. All the data is in one place and all that is left for us to do is to choose the time period, date and Category or Dimension we are trying to review or present to our users. Spend less time recording data and more time creating content that sells! Income reports are now easier than ever, with our traffic, income and expense tracker for bloggers. Use this tool to record all data related to your blog’s growth and bottom line to keep careful track of what you are spending, what you are earning, when you are earning a return on your investment, and how your traffic growth correlates with your revenue. Because we have found it very useful and because our site generates revenue by us promoting things we use and love, it only made sense to promote this tool as well. This tool works with all versions of Microsoft Excel however, if you want to be able to update the dashboards and the filters, you need Excel 2010 and above. If you have an older version of Excel, you will still be able to use the tool to aggregate your data. The only difference is that the graphs will not be automatically updated at a click of a button.